Before proceeding with the above concepts, lets understand when the CGST, SGST & IGST will be levied. Location of Supplier & Place of supply ⇒ same State. Which means 2 taxes will be levied i.e. CGST & SGST. 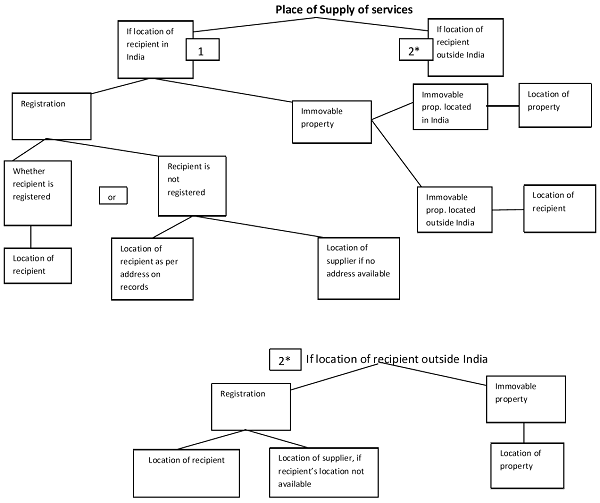 Location of Supplier & Place of supply ⇒ different State. Which means only IGST will be levied. Here, in this article, various aspects of supply of services are covered. ” the tax /gst collection chargeing is only one time means from manufacturer only…….or it should be levied or charged or collected at every supply of chain……manufacturer to distributor to dealer to consumer etc.